Parents of Edgar P. Harney Spirit of Excellence Academy students speak with a TV crew after the closing charter school's board appointed a new principal at a meeting on Nov. 7, 2018. Two days prior, the superintendent announced the charter school would close at the end of the school year. 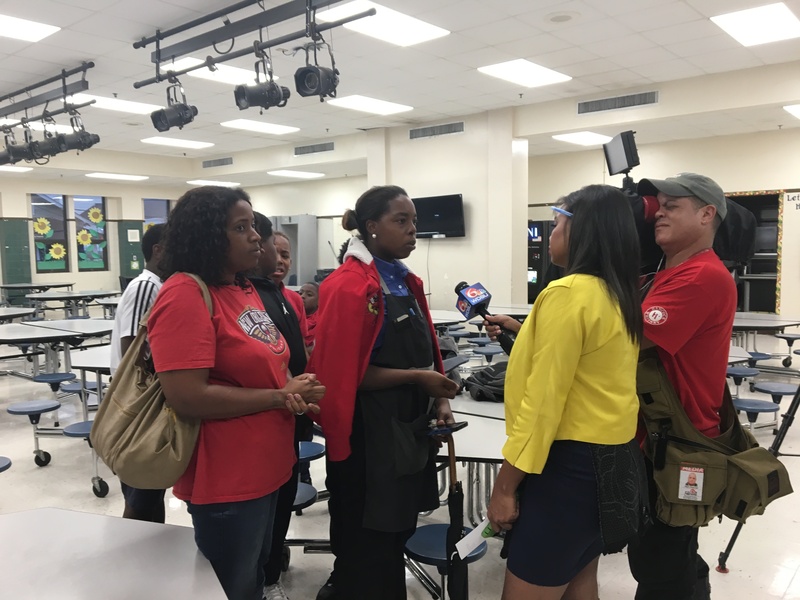 Parents of Edgar P. Harney Spirit of Excellence Academy students speak with a TV crew after the closing charter school\’s board appointed a new principal at a meeting on Nov. 7, 2018. Two days prior, the superintendent announced the charter school would close at the end of the school year. Days after Orleans Parish schools Superintendent Henderson Lewis announced a plan to close Edgar P. Harney Spirit of Excellence Academy due to mismanagement — and suggested that a criminal investigation may be coming — the finance committee for Harney’s governing board on Wednesday voted to expand the school’s legal team. The Rev. Charles Southall III, the charter school’s board president, said Harney needs someone who can assist the board’s lawyer, Kenya Rounds, with charter school law. The committee did not name a lawyer or set a budget. At a full board meeting that followed, the embattled Central City charter school also hired Cheryl Lawson as its interim principal. Early last week, Principal Ashonta Wyatt told The Lens she feared the board was going to fire her. On Friday, the board suspended Wyatt pending an investigation. But in an interview after the meeting, Wyatt said she had fired Lawson prior to her suspension, which left employees surprised when Lawson came to work Monday. Southall disputed that. “There was nothing in the records that said she was terminated,” Southall said. “I spoke to Southall prior to firing anybody and he said, ‘I’m not going to tell you how to run your school’,” Wyatt said. “It was strategic on their part,” she said of the board, noting the business manager who handles personnel files didn’t show up on Friday. Wyatt said her administrative assistant has a copy of Lawson’s termination notice, as does Lawson. Lawson said Southall called her over the weekend and asked her to serve as interim principal. The moves by the board come two days after a parent meeting where Lewis told families that Harney would close at the end of the school year. The C-rated school has racked up warnings from the school district over its financial practices and what the district said is a failure to provide adequate special education services. At the Monday meeting, Lewis called for all members of Harney’s board to step down. Lewis said the district has discovered matters about Harney that it has referred to the Orleans Parish District Attorney’s Office, which handles criminal investigations. The school district has also alerted the Louisiana Legislative Auditor about the school, he said. A handful of parents attended Wednesday board meeting. Parent Coanna Lawrence said she couldn’t believe Lawson was back at the school after being fired. Aiquilla Butler, who has four children at the school, attended as well. She said the board meeting “was like a well-kept secret” because it was very hard to hear board member deliberations. She moved as close as she could during the meeting and still had trouble hearing them.